CJR, in collaboration with Columbia’s Tow Center for digital journalism, covered the Nov. 6, 2012 election coverage. Seven student journalists from Columbia’s Graduate School of Journalism watched and read the coverage, working with CJR editors to report on digital innovation and integration of social media by news outlets as they presented election results. 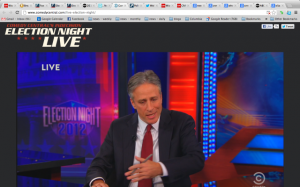 Their analysis ran in real-time on this live blog. Jacob Kushner covered the cable TV networks and published these seven posts during election night. A day after Fox News announced it will use exclusive, swing-state trending data from Twitter in its election-night coverage, social media geeks eagerly wait to see just how they’ll use it. But for for the sake of accuracy, they’d better not rely on Twitter to predict a winner.“Throughout the night on Tuesday, Twitter will keep track of breaking news, of the polls and candidates in swing states, and give much of that information exclusively to Fox,” Fox News anchor Jenna Lee told viewers yesterday.The election is by far the hottest topic on Twitter tonight, and some experts predict that users could overwhelm the network, causing a twitter ‘blackout’ that lasts through the evening. Traffic at the moment that networks call the election, or when the loser gives his concession speech, could break the record set during the first presidential debate that saw 10.3 million tweets.Earlier today, Yahoo! News published a story by a PR company that used Twitter trending data to predict Obama will take Ohio. And Mashable has a map that shows which candidate is favored by Twitter data in 12 swing states. All the nation’s major cable TV networks are working in close step with each other projecting wins in early states despite only small numbers of votes being counted. CNN, Fox and ABC all called Georgia, South Carolina and Vermont for Romney with less than 3 percent of the total votes accounted for (and only one percent in South Carolina). A New York Times article today reported that the networks are being particularly cautious tonight in their projections following some major screw-ups in recent months. Most notably last June, CNN and Fox came under fire after they incorrectly reported that the US Supreme Court struck down Obamacare when in fact the court upheld it. Just last week, CNN furthered a false rumor that the floor of the New York Stock Exchange had been flooded with three feet of water in the wake of Hurricane Sandy. In fact, it remained perfectly dry. And of course it’s impossible to forget the embarrassing screw ups during the 2000 election in which TV networks alternatively called Florida for Gore, then Bush before retracting their projections all together. All the networks say they’ll abide by the rules not to project any national winner until 11pm Eastern, when the polls close on the west coast. Stay tuned to see if they keep their promises this time. If you’re watching NBC, Obama’s on the verge of winning, so long as he gets Ohio, where so far he’s winning with 50 percent of the vote counted. If you’re watching CNN, it’s far too close to call, but the key remains Florida. Fox News was in the midst of a confusing panel discussion that ranged from the importance of Virginia as a state—generally—to the character of Bill Clinton. “In Milwaukee, a federal van from the government taking people to the polls. That’s reported by a group called Media Trackers,” said Fox News correspondent Eric Shawn at around 8:40 pm Eastern. “This ‘potential fraud’ has to get hunted down by prosecutors and the authorities.”Media Trackers claimed earlier today that a federal Jobs Corps van reportedly carried as many as 125 voters to the polls in Milwaukee, Wis. during various trips.“Poll workers inside the location struggled to handle the extra traffic created by the Job Corps participants brought in from a nearby training facility,” according to the report.Perhaps the authorities will check this report out, but Media Trackers shouldn’t necessarily be taken at face value. According to PolitiFact the group is a conservative watchdog organization funded by American Majority, a Virginia organization founded by a leader of the Tea Party—and it has a history of making misleading or inflated claims about the electoral process. 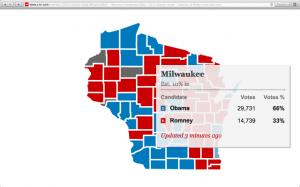 The factchecking site labeled a Media Tracker’s statement regarding the recall of Wisconsin Gov. Scott Walker as “Mostly False,” its second-worst rating. Last month, The New Yorker’s Jane Mayer wrote about “The Voter Fraud Myth”—the myth being that America’s immigrants and convicts routinely vote even though they are ineligible to do so, and that liberals illegally use federal resources to help voters get to the polls. That hasn’t stopped conservative groups like Media Trackers and others from making many claims today of illegal voting. From Colorado to Florida and all the swing states in between, CNN is focusing its broadcast election-night coverage on the key counties that are expected to tip the race.It works like this: Wolf Blitzer announces breaking new results in from the latest swing state, then hands it over to John King who points to a county-by-county map of the state shaded in the familiar blue and red. King reads off the number of votes recorded in a handful of key counties, then tells us it’s still too close to call.The network has even gone a step further in states like Wisconsin, where a reporter spoke live from inside a Milwaukee County tallying center at around 10:30 pm. He described the results from specific, Republican-centric parts of the county to contrast them with those from the more liberal Milwaukee urban center. “We are projecting Barack Obama is the President of the Unites States once again four years later,” broke in Jon Stewart during the third segment of his election-night show. Calling today’s election “Democalypse 2012,” The Daily Show went live at 11pm Eastern to give its take on the race.“Good news for Mitt Romney: He has won as we can report tonight most of the confederacy,” said Stewart, who began his coverage by announcing Obama’s wins in Pennsylvania and Elizabeth Warren’s Senate win in Massachusetts to loud cheers from his studio audience. Calling Florida a state “where Cubans go to live and where Jews go to die” he announced it’s still too close to call.Correspondent John Oliver ridiculed the sensational rhetoric of other network coverage, strapping iPads to his elbows and drawing on a tweet from a guy who said “I voted for Mitt Romney” to predict a Romney win.“Don’t tell me that cable news is not alive and kicking,” he concluded.Another correspondent poked fun at Obama’s small-scale fundraising tactics by which his campaign sent emails and texts to supporters asking for donations as small as $5. Read these stories as they were published at the Columbia Journalism Review.